Waves break along the sands of Dune Beach in Southampton, New York as high tide rolls in. Clouds skirt overhead in step with the breaking waves on a very pleasant morning for a walk on the beach. Mornings in the Hamptons often find a thin marine layer of clouds floating above. On days such as these, the clouds will quickly burn off and beach goers will quickly fill the beach. 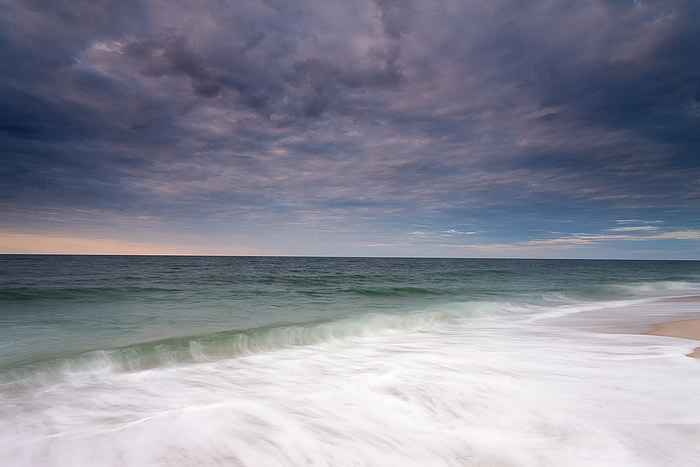 The diffused light on mornings such as these really help to highlight the aqua marine colors of the Ocean and Sky. Photo © copyright by Thomas Mangan.